I’m sure that none of you ever get angry. And neither do I. ha. So why write a prayer for when I feel angry? Because if we’re honest, all of us experience feelings of anger. Some of us use words intended only for the dictionary. Some of us throw things. I’ve been known to say nothing. Until I’ve cooled off, which can sometimes be, well, anything from a few hours to a few days. Just being honest. There have been times! Because I’ve never heard anyone read the verse after it at the same time. And I think that verse really explains why we can’t get angry and hold grudges. Regardless of how the feeling is processed, I’ve found that prayer is THE BEST way to combat anger. Whether the situation simply must be given over to the Lord or a person needs to be lifted up to the Lord, prayer is critical to combating feelings of anger. My prayer for this prayer is that those who read it will feel the love of God surround them and the anger will dissipate. I feel like I can only see stars. And I can’t understand the situation. Help me, Lord. I need you. To wash away the madness. Hey there Bloggers! 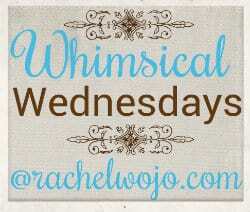 So glad to have you linking up to our weekly blogger linkup, Whimsical Wednesday. This week will our last Whimsical Wednesday blogger linkup for the year as I focus to meet my next book writing deadline of January 8th. Just wanted to give you that heads up! Thanks so much for joining the weekly party promoting Christian encouragement! For more everyday prayers, be sure to check out Extraordinary Prayers for Everyday Living! 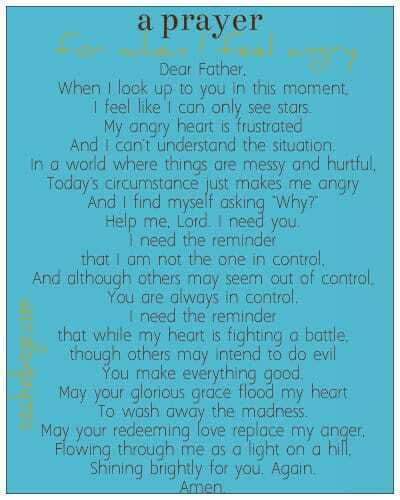 Great prayer! I tend to be a stuffer so you might not see my anger on the outside but my insides could be boiling. Ephesians is a beautiful reminder that our emotions can open the door for Satan to come walking in. Let’s show Satan today! Good luck with your next deadline! I cannot wait to hear more about your book as you move toward publication. Hugs and have a wonderful day! Thank you so much, Mary. I’m excited to focus and finish up this first round of edits. Blessings on your day today! Thanks for linking up, Beth! Thank you Pam!! Blessings to you. Two weeks ago a situation at my work happened. I got so mad I started crying and I could not stop for hours. I even attended my Wednesday night and broke down crying. I was so angry, then I was mad because I let them steal my joy. I did not explode at work…which in the past I would have, I calmly held it in. Hiding the tears was not easy. I wanted to go get a drink and drink away the problem. I made it to my class. Expressed I needed prayer for my anger and my class prayed for me. They also said they would be praying for me when I went back to work the following morning. It took everything I had to go in but as I prayed and my class prayed I could feel a calm come over me. i typed out my concerns and handle d the situation professionally but I would not have been able to without God and my Wednesday night bible class. I’m so glad you are connected to God’s Word and a loving group of Christians, Gail!! He saw you through and what a testimony you are! Thanks so much for your boldness to share this with us.